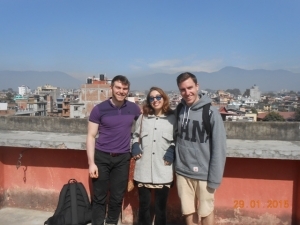 Our volunteers in Nepal are nearing the end of their first stint teaching in the Kathmandu Valley. 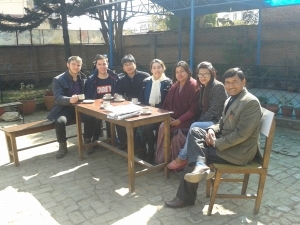 Next week they begin the Oyster ‘holiday month’ during which they will go on a trek in the Himalayas, tour Tibet, go white water rafting and on a safari in Chitwan National Park, before heading back to the villages to continue with their teaching. “As I waited to board at my gate in Delhi, a young man with a thick North-England accent introduced himself as Samuel. He would be one of the three volunteers coming from abroad to teach in Nepal, and we both shared a similar lack of teaching experience. This eased my nerves as we boarded the flight for the short 90-minute jump to Nepal. As the plane began its descent out of the clouds and into Nepalese air space the passengers gradually got louder and louder, pointing outside their windows. I looked out and saw massive hills with rice fields and homes carved into their sides. At first I thought I saw big clouds in the distance, but I let my eyes adjust and absorb the sight of the Himalayan Mountains. The Nepalese men on the plane were ecstatic and laughing as they pointed at the mountains. I would later learn that most of these men worked in India, and had not been home in a long time, accounting for their bliss at the sight of the mountains. I certainly shared their excitement, but in a different way, as we all could not wait for the plane to touch down in Kathmandu. I got off the plane, paid for my Nepali visa, and met Sam at the baggage claim before heading out to find Basant, the Nepali representative for the trip, who welcomed us with a ‘Namaste’ (hello), placed ceremonial scarves around each of our necks, and took us to the car. We piled into the back, and drove down the famous Ring Road that surrounds Kathmandu, similar to the Beltway around Washington DC. As we swerved through traffic, Basant briefed us on our upcoming four months, while Sam and I stared out the window in total awe that we had finally arrived in Nepal. Immediately, I was noticing differences between India and Nepal. The people seemed happier, the streets were cleaner, and the sky was much more visible. Far fewer people were on the streets, and I have hardly seen any cows or pigs on the road. One difference is the way the electrical wires are hung, like a massive birds’ nest at every street corner. Hundreds of wires wrap around each electrical post, with lose ends dangerously dangling just above arm’s reach. We dropped off our bags at the hotel in Thamel, the tourist district in Kathmandu, and headed out for a traditional Nepali dinner at a local restaurant with Basant. We enjoyed the excellent meal of dal bhat, while watching traditional dances from all different regions of Nepal. I had not appreciated the ethnic diversity of Nepal, as all the dancers looked to be from different parts of Asia. I asked Basant if these girls were immigrants, but he explained that Nepal is quite regional, and that people tend to look more Chinese in the north and more Indian in the south, leading to the wide range of smiling faces on the stage. Following the meal, we wobbled home to our hotel and slept in anticipation of the day ahead. We woke up at 9 a.m., before leaving for a sight-seeing trip around Kathmandu, to be followed by a meeting to prepare us for life in a Nepali village. Already I found that I had slept more peacefully than in India, as there was no loud praying or honking to wake me up at 6:00 a.m. Nepal has a slower pace to it, and noise on the streets does not start until closer to 7:30, which was a delight. We ate breakfast quickly, and got into the car that would take us all through Kathmandu, stopping first at the Monkey Temple. As we drove through the city, I noticed that what Kathmandu lacked in pollution, compared to Delhi, it made up for in dust. The streets are dry, and as cars and motorcycles fly over them, dust clouds are sent up into the air, blocking visibility and making breathing difficult. Fortunately, the Monkey Temple is at the top of a hill overlooking the entire city. The temple is a large white round dome and golden steeple, with Buddha’s eyes painted on the four sides. 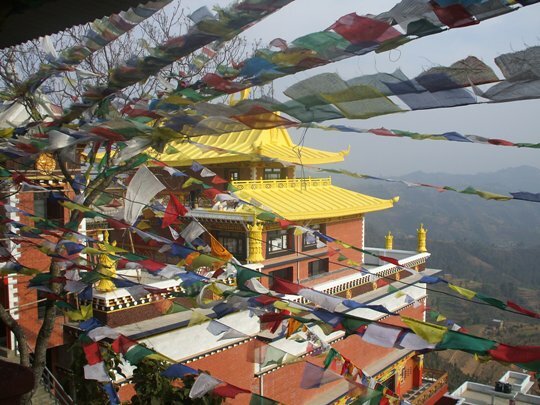 It is surrounded by a ring of prayer wheels, more small temples and a museum dedicated to Buddha. There are, of course, monkeys everywhere, jumping on the surrounding trees and swinging on prayer flags. Toget down the hill you must walk down 365 steep steps that are guarded by more monkeys. We headed down the steps and got back into the car, driving down bumpy dirt roads on our way to the next stop on the sightseeing tour. That evening we enjoyed a delicious Tibetan meal at our hotel. The food has been excellent in Nepal thus far, and I am intrigued to see how the meals will be in the village. As we ate, we talked about what to expect from teaching, and how difficult it might prove to be for us in the coming months. The next day was dedicated to a lesson on teaching in Nepal, followed by a lesson on how to speak Nepali. The first was mainly focused on how boring and repetitive the Nepalese school system is, and that our role would be to tap into the children’s creative side. The language lesson was quite difficult but our teacher, Ram, was hilarious, and made the learning that much easier. So far I have mastered: Namaste, how to introduce myself, how to let my Ama (Mom) know that her food is delicious, and if I am too full, as well as saying that I do not eat yogurt or hard-boiled eggs. Thanks for writing this excellent blog Kenny, I certainly enjoyed reading this and cannot wait until the next installment! If you want to enjoy all that Nepal has to offer and follow in Kenny’s footsteps, check out our teaching in Nepal webpage and book your place on our January 2016 four month programme. If you have any questions feel free to contact me [email protected]. If you have a question for Kenny, I can forward it on to him.